"Being nice to someone you dislike doesn't mean that you're a fake. 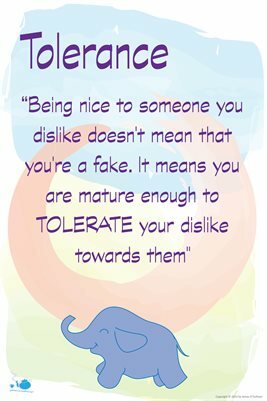 It means you are mature enough to TOLERATE your dislike towards them"
When we develop tolerance, we can walk and go anywhere regardless of who is there. Even the most obnoxious person can't have any control over our emotions. Surely this is one of the most important habits that we need to develope to help us survive difficult people and situations and maintain our valuable happiness.